The first thing I noticed about March's box was the new look packaging. Instead of arriving in it's usual brown cardboard box, #paperhaul's packaging has had a little bit of a makeover with the latest selection of stationery goodies arriving in a slim white cardboard envelope. 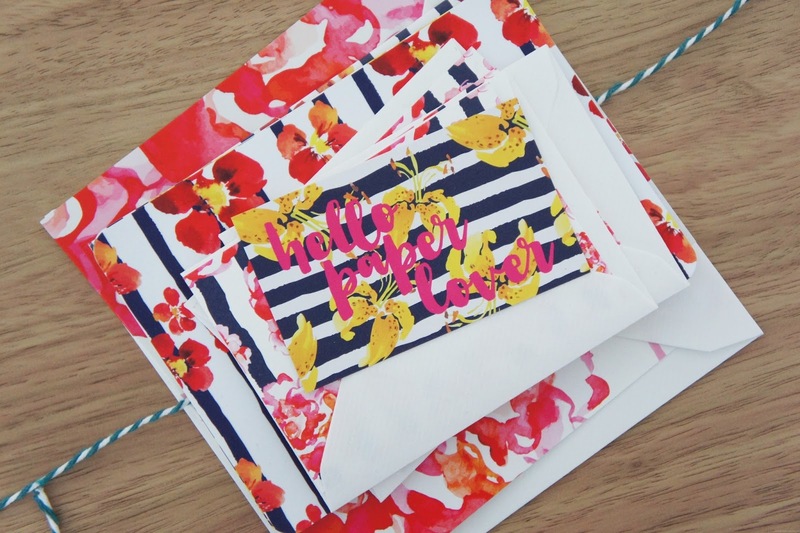 This more compact style works well for the contents of #paperhaul and came complete with a pretty 'your #paperhaul is here' sticker, matching the designs featured inside which I thought was a lovely touch. This time around the box contained postcards, notecards, a large greeting card and a small notebook, all featuring bright watercolour designs. The beautiful bold florals were the perfect compliment to the sunshine and spring blossoms that have arrived with April and I loved the variety of greetings included with something for every occasion from 'consider yourself hugged' (as pictured above) to 'miss you', 'bonjour', 'birthday hug' and 'yes! '.